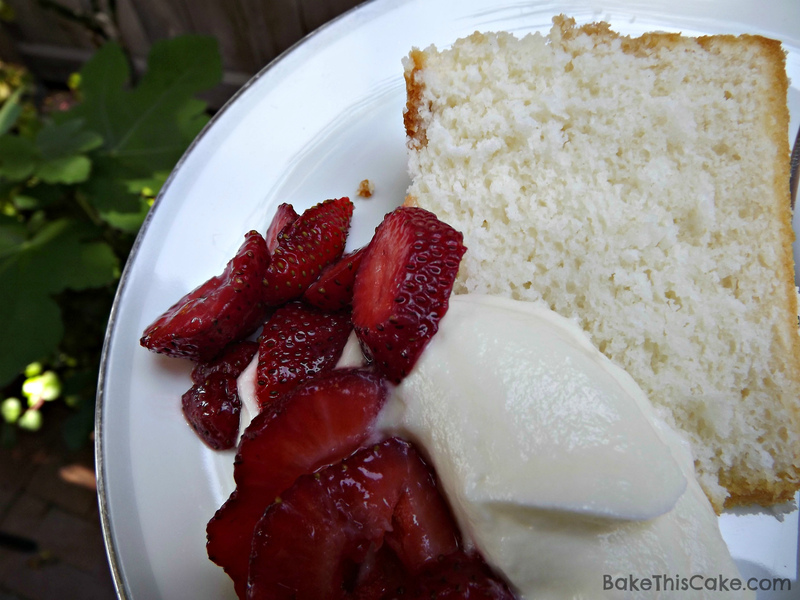 Vintage Summer Snow #Cake Recipe with Strawberries and Cream | Bake This Cake! White as snow — or bright as the summer sunshine on your party patio! Yes! 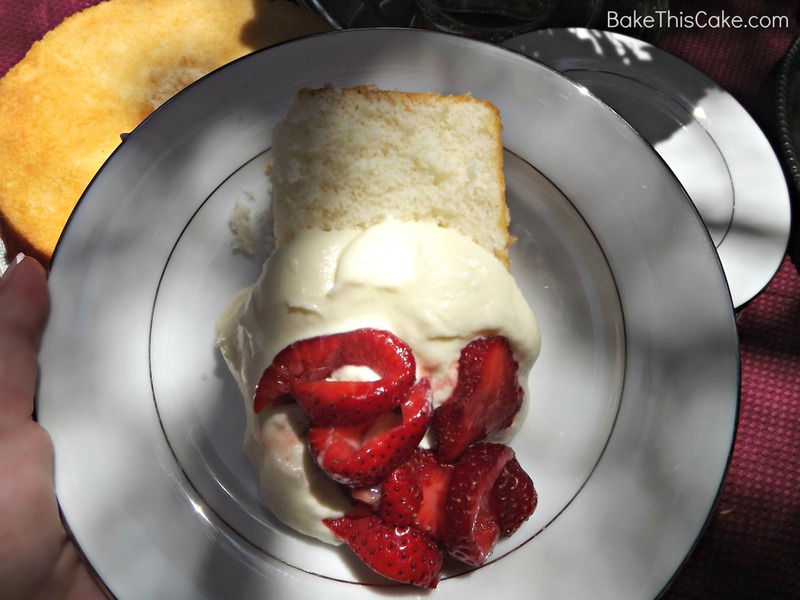 Dribble some fresh strawberries and cream over top and you’ve got a fluffy homemade white cake that’s tender and downy just like the scratch cake your grandma used to make. 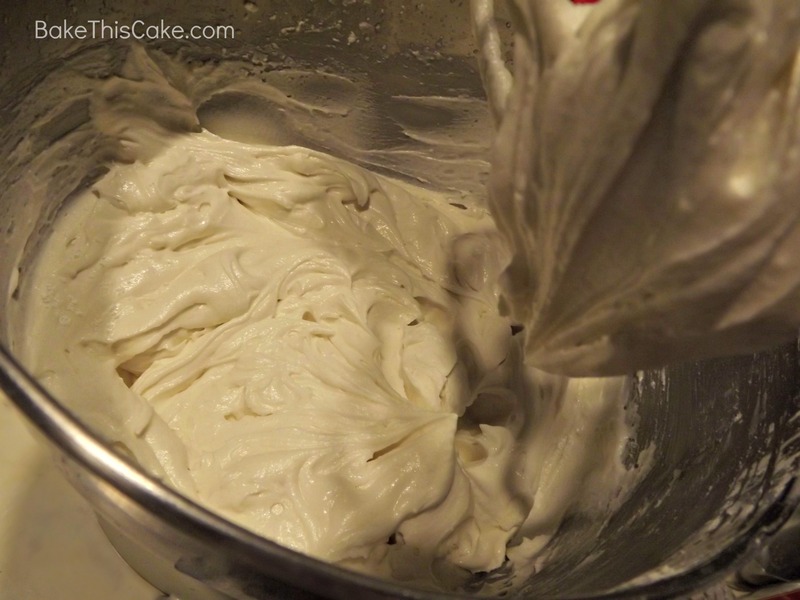 Throw in the fact that this recipe is over a hundred years old and similar to (or better than) that airy-go-lucky Angel Food Cake and you’ll have a winning vintage cake hit on your hands! 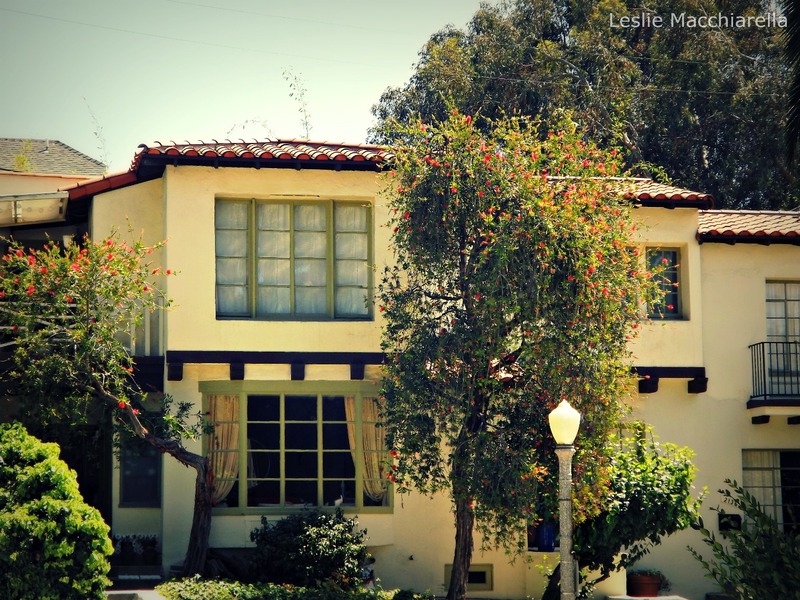 Sweep off that patio for outdoor dining! 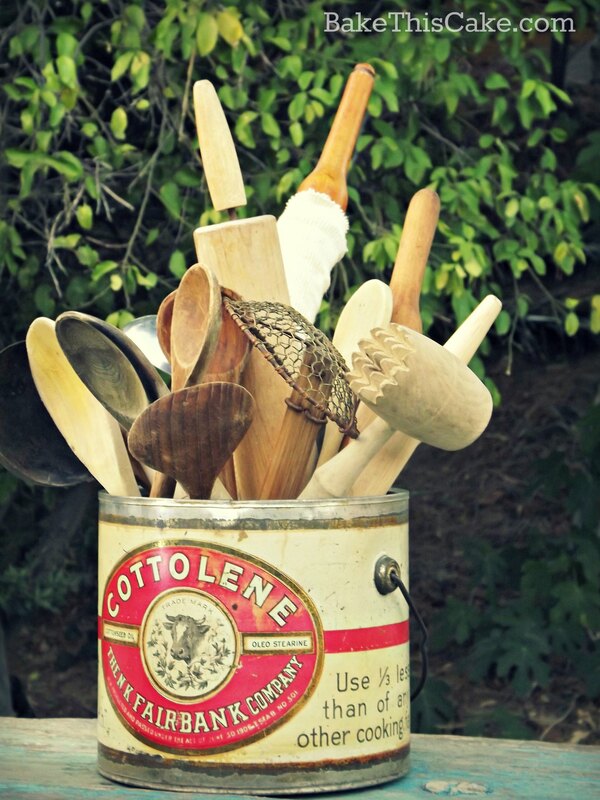 Haul out your cool barbie and dust it off for BBQ season. Whoo hoo! 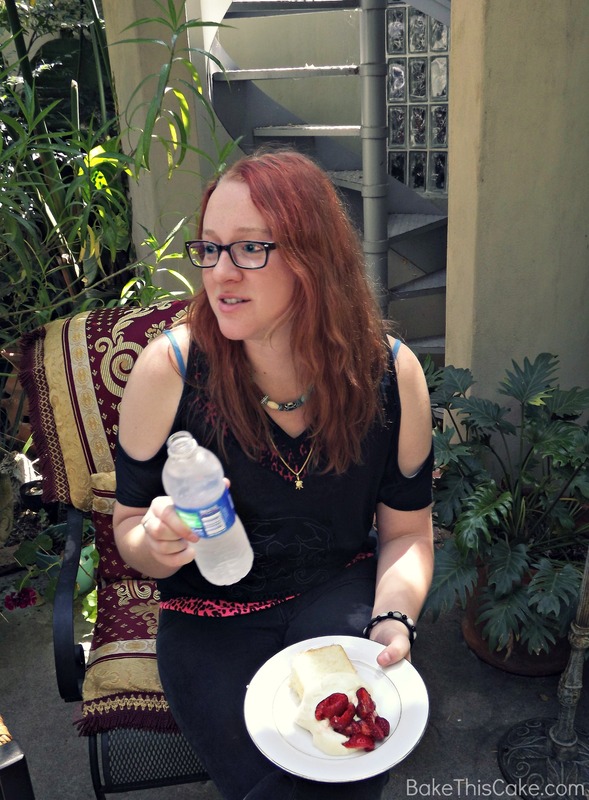 Even in the city, where space is tight, there’s always room for outdoor food gatherings, right? 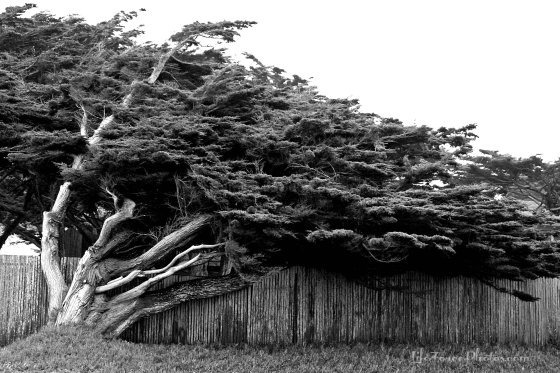 Even if it’s just outside your front door, on a balcony or on the porch. 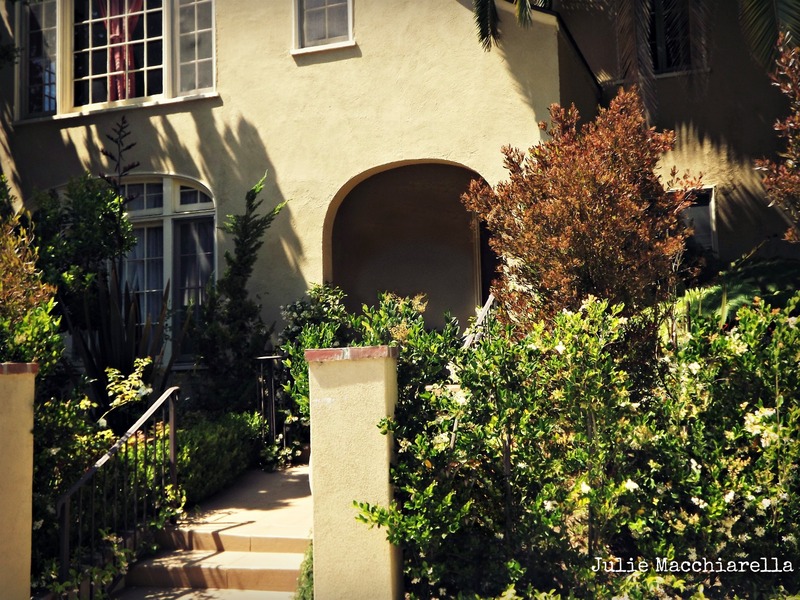 We’re hanging out this fine morning in the Hollywood Hills — where even the houses are a throw back to the vintage era…ha! It’s time to kick back and relax! 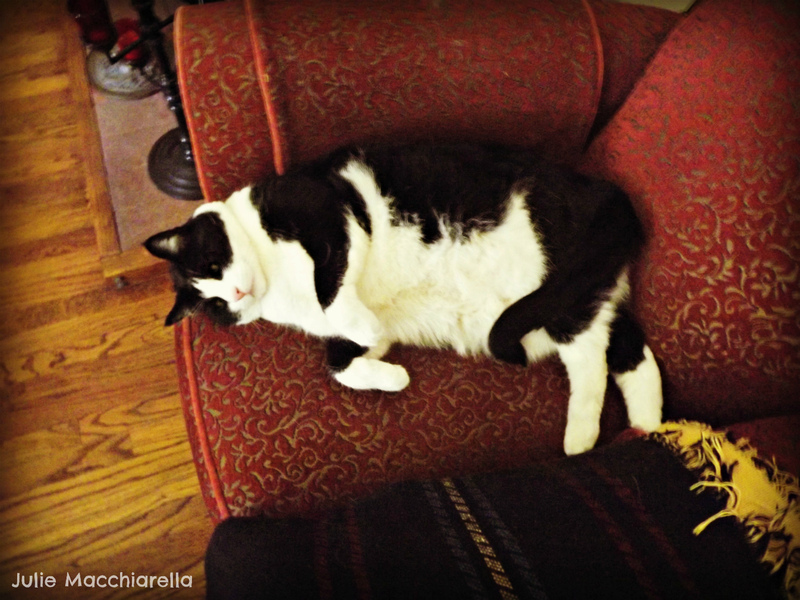 Like brother’s big ‘ole cat, Gigo (perhaps one of THE largest kitties in SoCal). Take a lesson, cause this kitty knows how to RE-LAX! Gigo. Brother Mark’s Giant Cat. 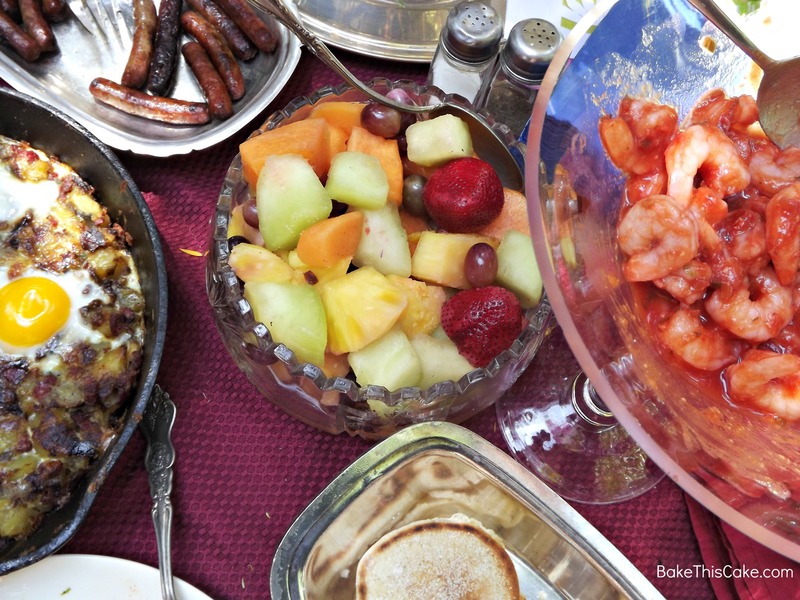 On the brunch menu: Locavore-style (only local) California Fresh Fruit Salad, Shrimp Cocktail, Bill’s Country Skillet Hash & Eggs, Grilled English Muffins and Barbecued Italian Sausages…and a beautiful morning! My son, Michelangelo, is home for a bit before he starts his Latin & Ancient Greek Studies at Berkeley (who knew! 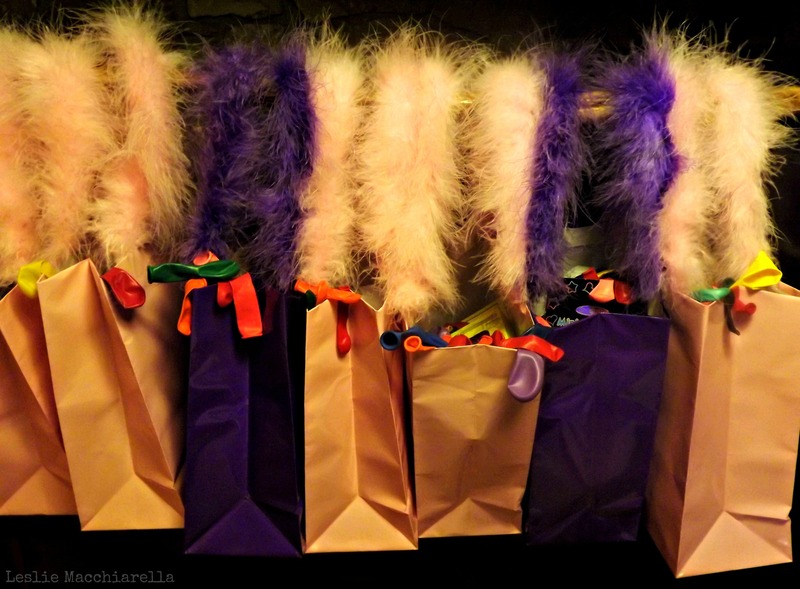 ), Julie is having a birthday, and Granny Vi (our Queen) is always ready to party with friends and family. The Brothers Are Cooking Manly! 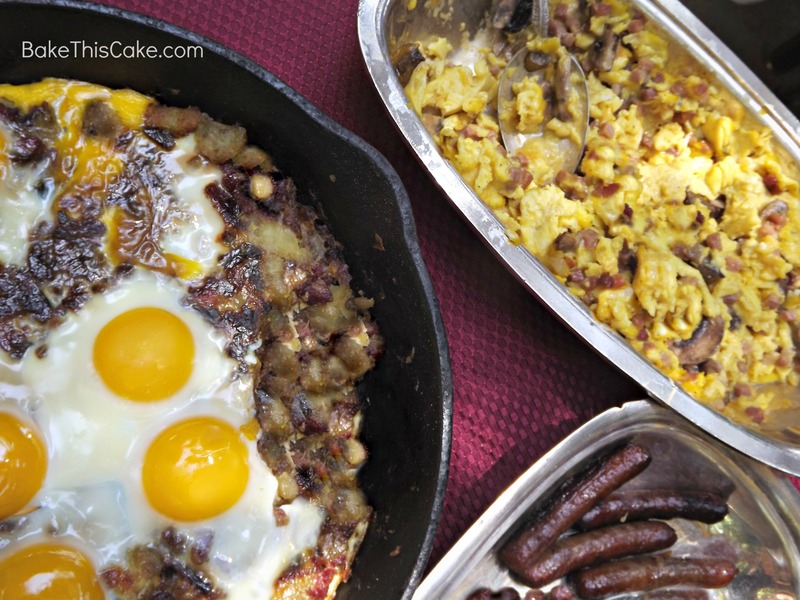 Check out what the brothers cooked up: Bill’s Country Skillet Hash & Eggs and Mark’s Pancetta-Mushroom-Cheese Eggs…Good work, bros! Throw in some Champagne and O.J. 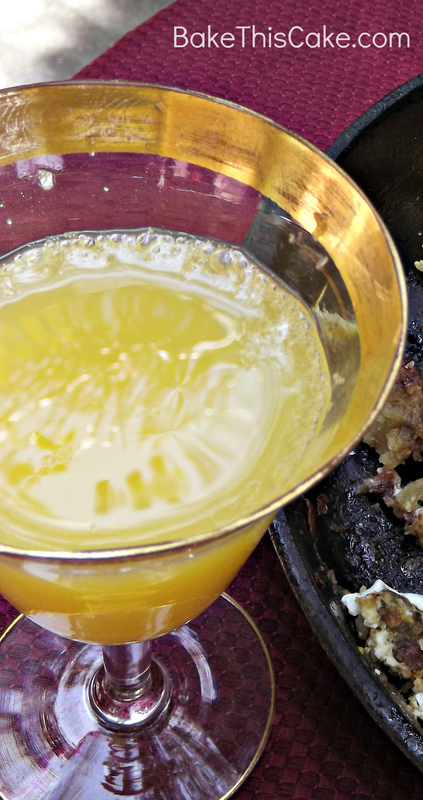 for Mimosas and we’ve got a lovely little patio party on our hands. 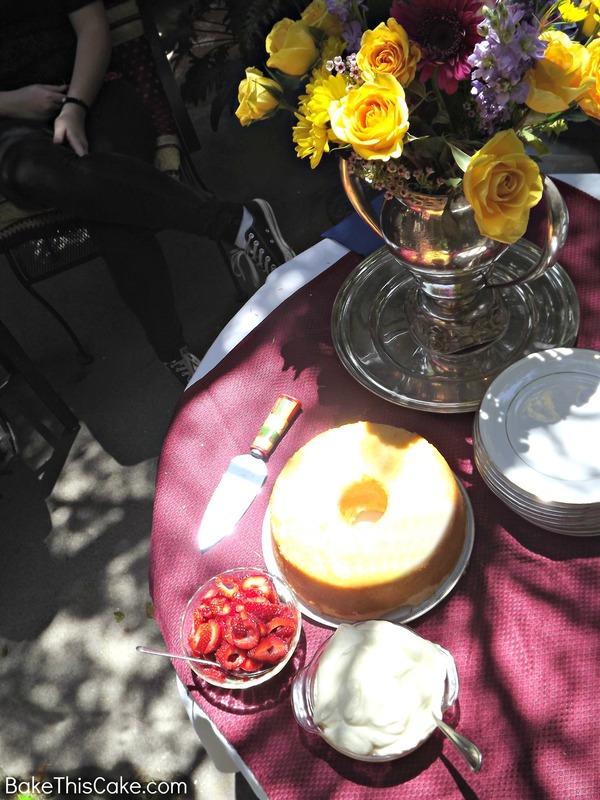 And how about a little vintage recipe homemade white cake for a light and lovely addition to the patio brunch! 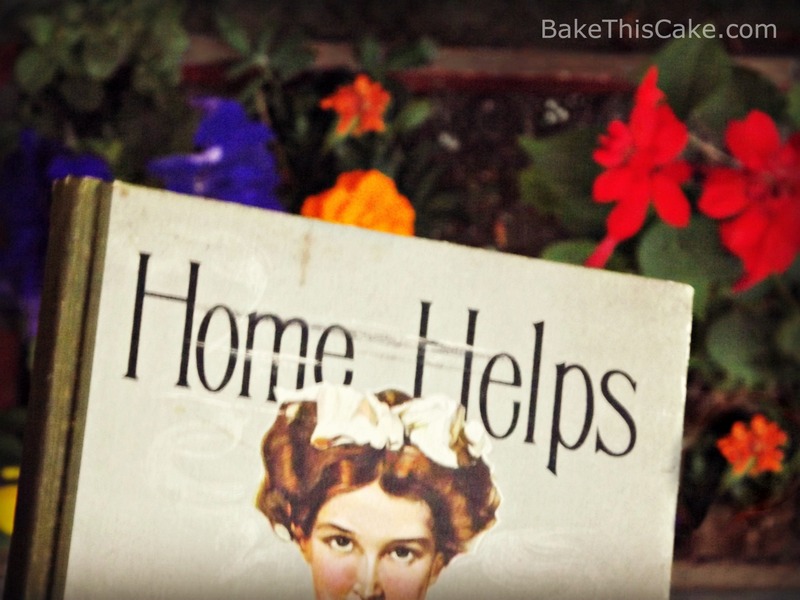 Our cake recipe today hails from the vintage cookbook charmer, “Home Helps”. The book was published in 1910 “in the interests of Cottonlene”, to promote the use of the cotton oil product in place of lard or butter. Although Cottonlene is no longer around, this little gem of a cookbook has lasted the test of time in part because 5 famous culinary experts were gathered together to share their recipes in the book: Mrs. Mary J. Lincoln (first instructor at The Boston Cooking School), Lida Ames Willis (edtitor at the Chicago Journal and Cooking Instructor), Mrs. Sarah Tyson Rorer (heading up The Philadelphia Cooking School, culinary editor and author, aka “Mrs. 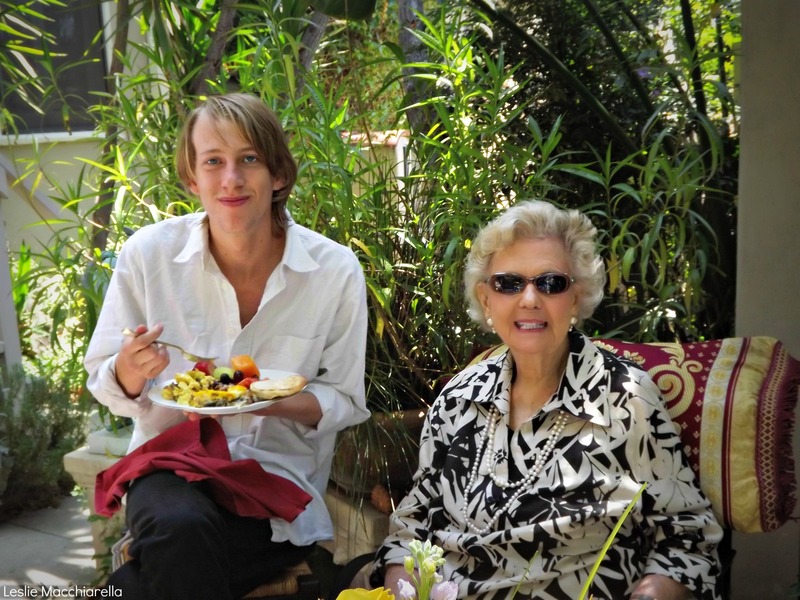 Rorer”), Mrs. Helen Armstrong (Cooking Instructor and Lecturer) and Marion Harland (aka Mary Virginia Terhune, novelist and cookbook author). 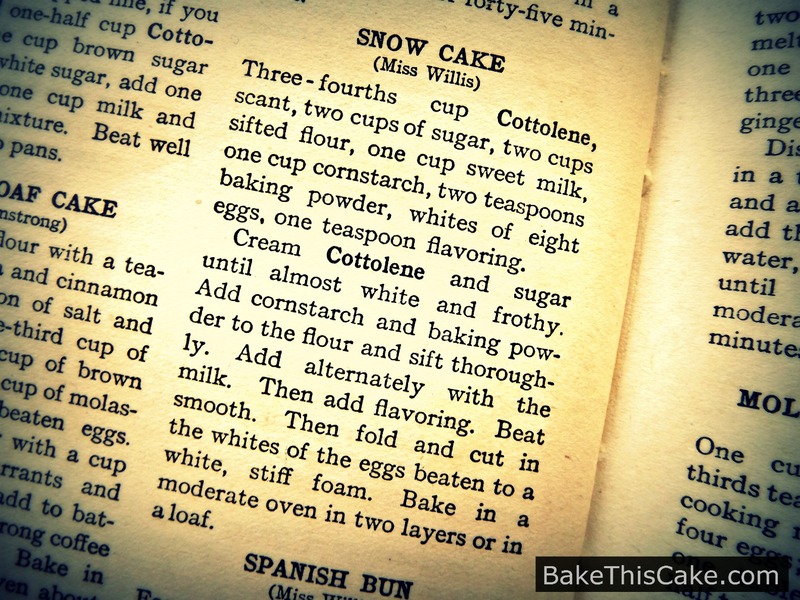 Although Snow Cake was around previously in forms similar to Angel Food Cake, this cake recipe was presented in the book by “Miss Willis” (Lida Ames Willis). In 1987, Miss Willis was the “Editress” of the Chicago Journal‘s Household Department’s “Pure Food Notes” column. We also see Miss Willis listed in the 1900 Census in Evanston at the same address. She was 39 years old, born in 1861 in Pennsyvania, single, living as a Boarder with Dr. Abbie Hinkle, the good doctor’s sister and widowed mother, a servant and the servant’s baby boy. Famous cooking instructors at the turn of the Century didn’t have the Food Network or Top Chef TV shows to showcase their talents and teach their fans…BUT they had the bustling Home Economics Lecture Circuit…and American women were very interested in learning the home arts crafts and household management– so this was big business! 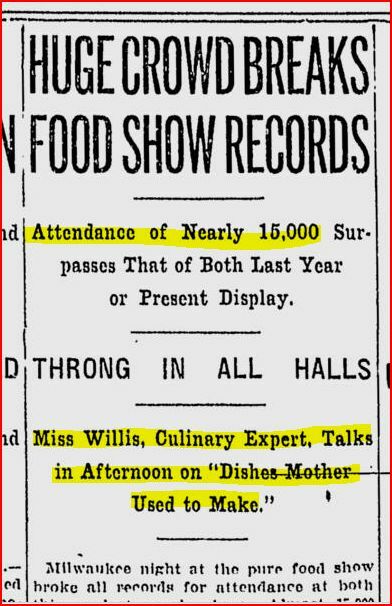 By 1911, the Miluakee Sentinel, reports huge crowds at the food show with our Miss Willis. She was was leading the bandwagon with her cooking and baking lectures! 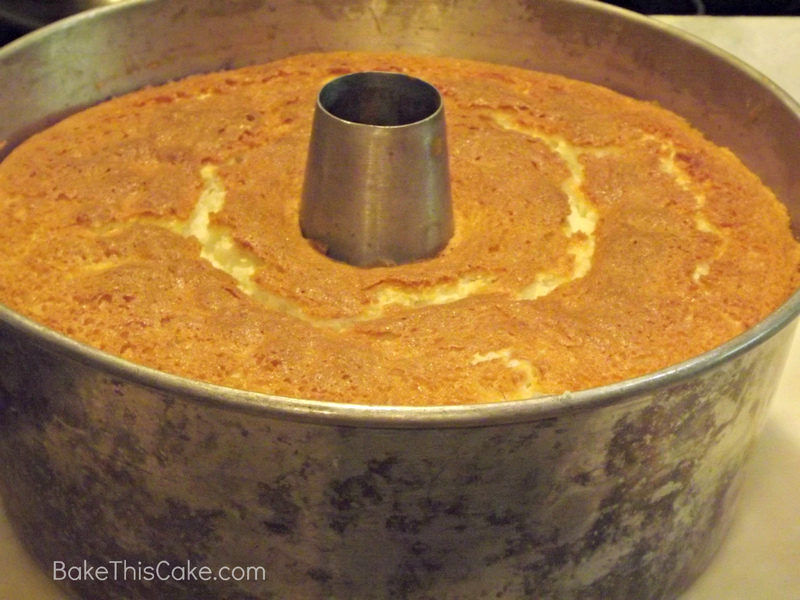 The Cake Specifics: It’s similar to an angel food cake but with more cake-like oomphf. 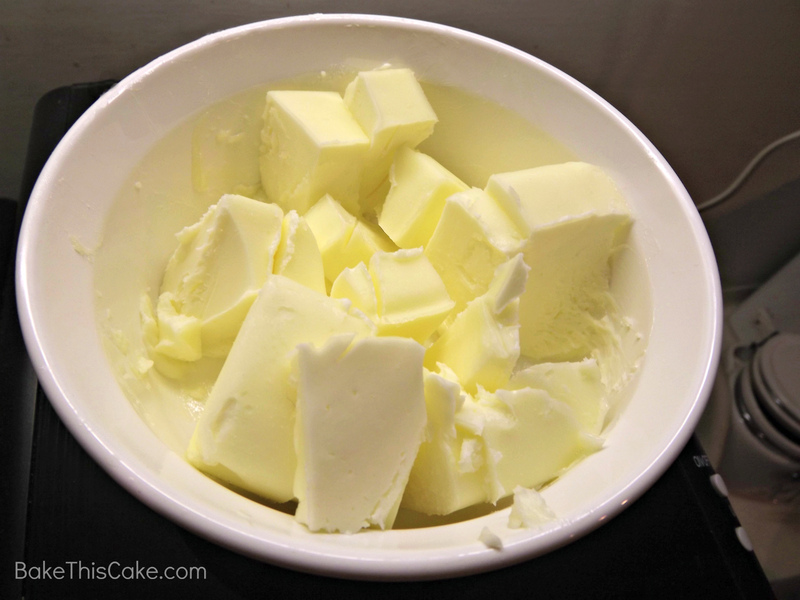 We modified the recipe slightly to substitute butter for shortening, and we used vanilla for flavoring — with an extra dash to yum it up. Otherwise, this recipe is in full charming vintage condition. 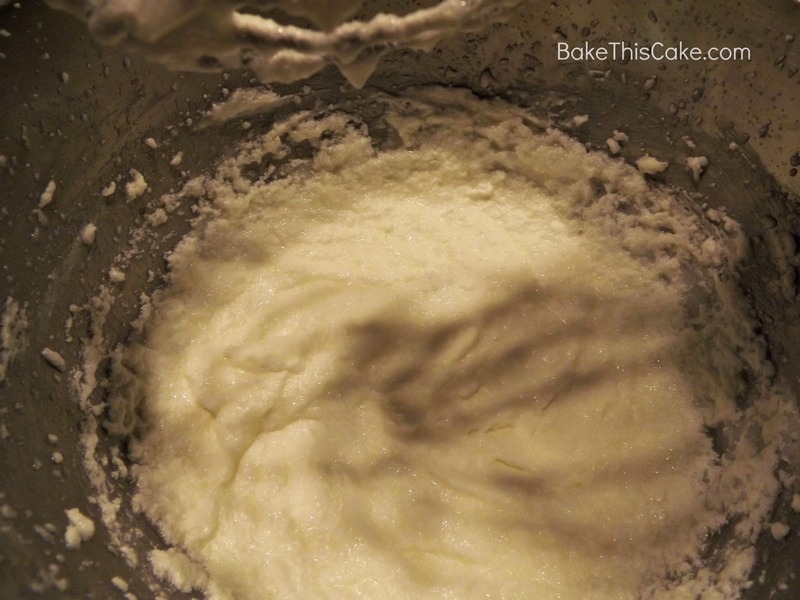 This is the secret ingredient that Miss Willis added to the all-purpose flour in this recipe. 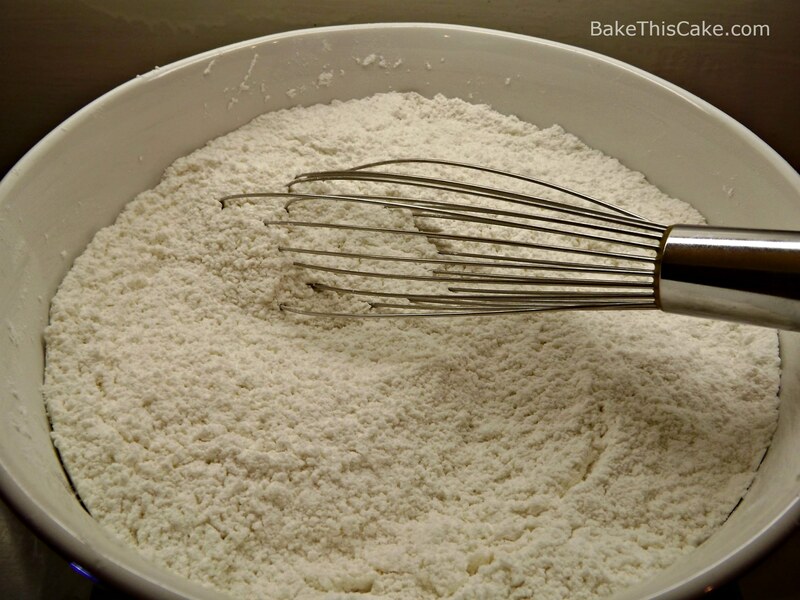 You might have used corn starch as a clear sauce or gravy thickener in the past…or even a small portion in a cake recipe — but this is a large quantity. (I thought it was a typo at first!) 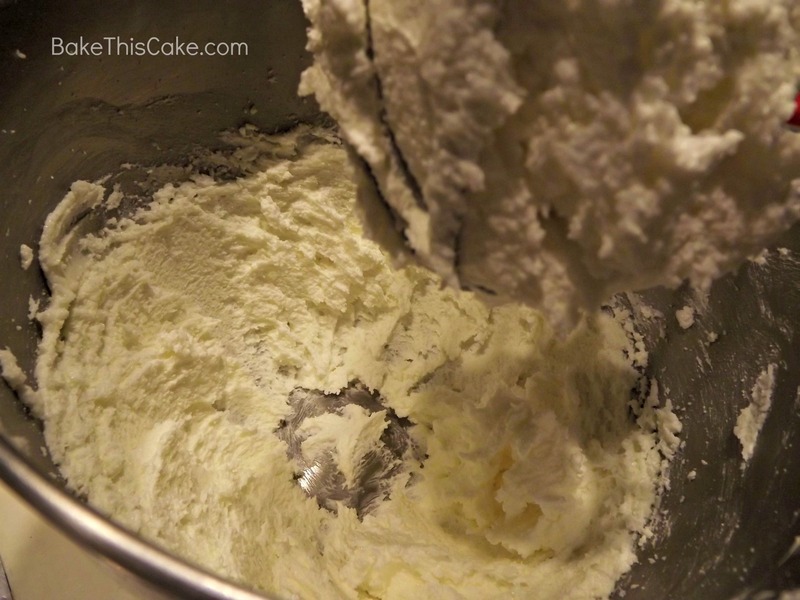 And it works like a secret agent to tenderize the flour texture. 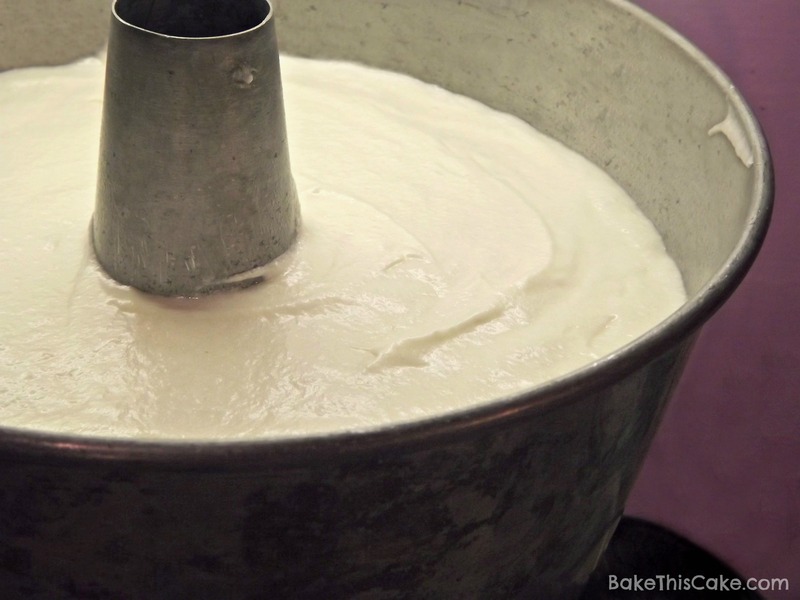 This non-gluten and powdery starch (sometimes called “cornflour” by the Brits or “maize starch” or “maizena” in European parts of the world) adds a little tenderness and some body to a cake that is just a few egg whites short of an Angel Food Cake. So don’t short-cut this ingredient because it really does add a little tenderness! Set center oven rack to center position and pre-heat oven to 350. Spray a tube pan with a spring-form (removable bottom) with cooking spray (or butter it well). 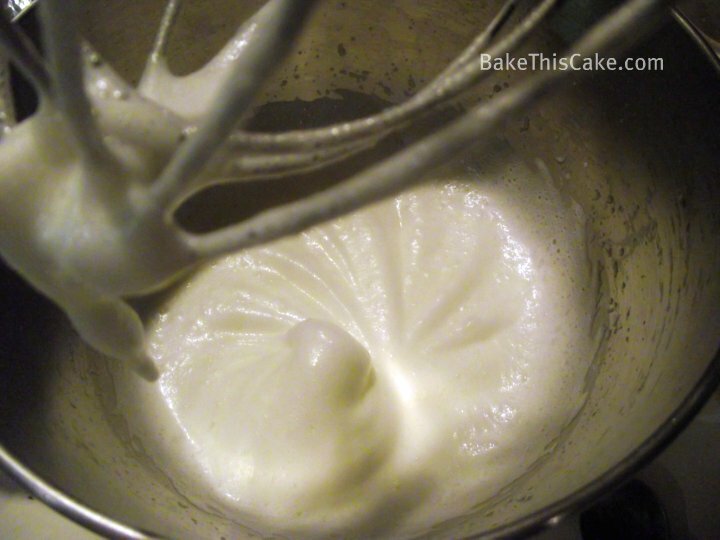 Tip: The batter will be thick and smooth and creamy-dreamy! Scoop the batter into the prepared tube pan and smooth the top of the batter and pop it into the 350-degree pre-heated oven for about 35 minutes (up to even 45 minutes in some ovens) until golden brown and center toothpick (or longer) tester comes out clean (internal temperature about 185 degrees). Oooh! Lookie what we get for tripping down history lane! 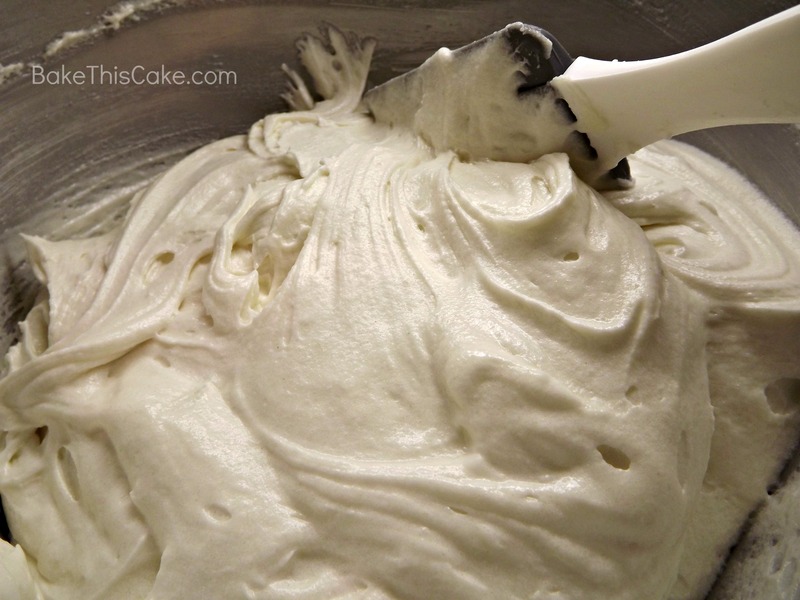 Cool the cake in the pan for 20 minutes before removing. 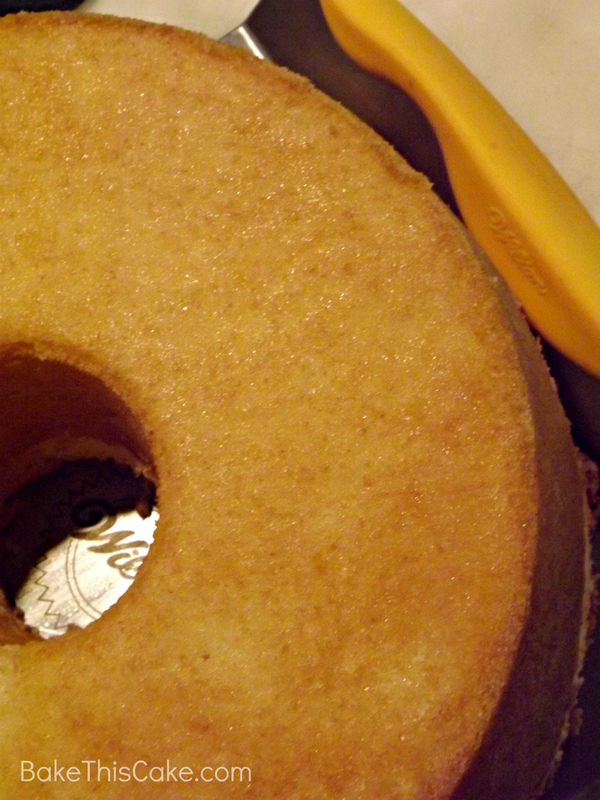 We used a big cake flipper to move the cake around, but it handles (and travels) well. 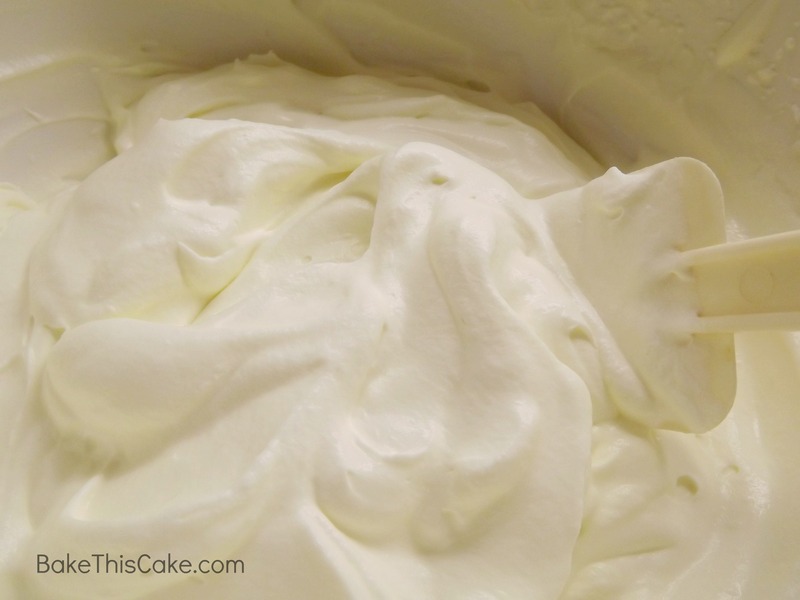 A little soft-whipped heavy cream with some sliced fresh strawberries are a nice addition to the cake. 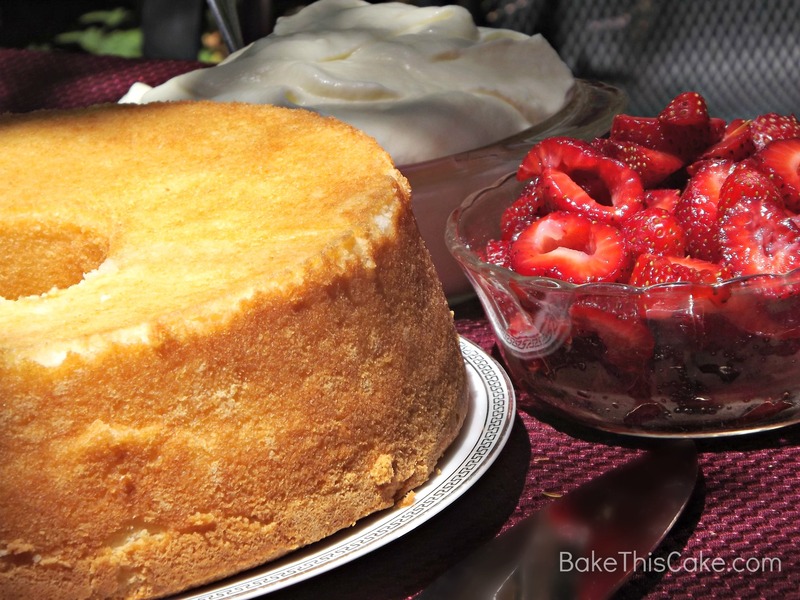 This cake works well for potluck with fixin’s set next to the cake so that folks can help themselves to a slice and a dollop of cream with berries. So happy you were able to join us for this little history baking recipe and I do hope you’ll have a chance to bake it soon! 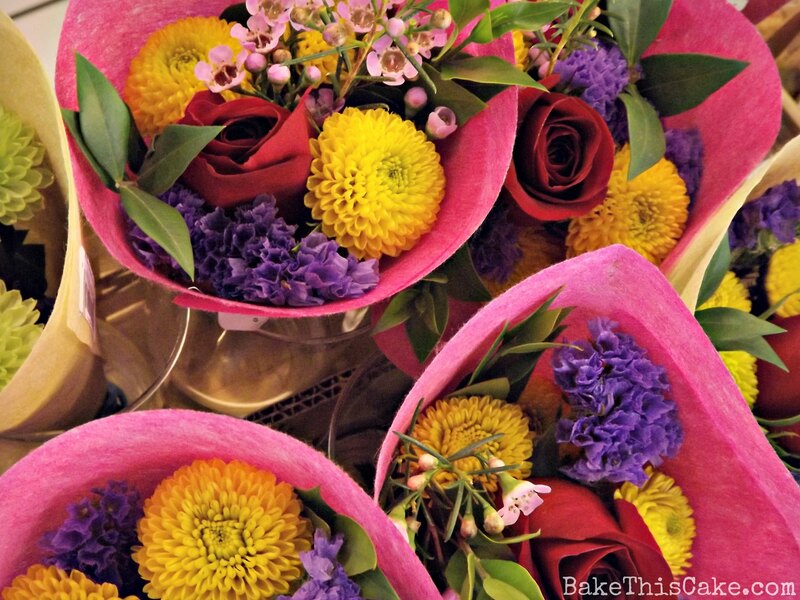 Don’t forget to join us on Facebook, Twitter and Pinterest…if you’re not with us already. Show us your own photos of your Snow Cake creation and tell us in the comments if you’ve ever have a Snow Cake before? I totally love hearing from you! Julie turns 21, whoo hoo! 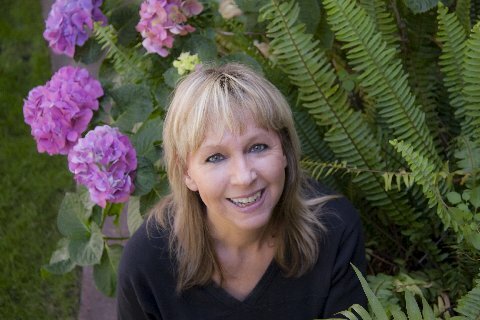 Wonderful blog, I see you may have moved on but I’ll have to peruse the archives! Still here baking away with just a zillion projects in the works. Thanks for stopping by and checking out the vintage summer snow cake. Wow! 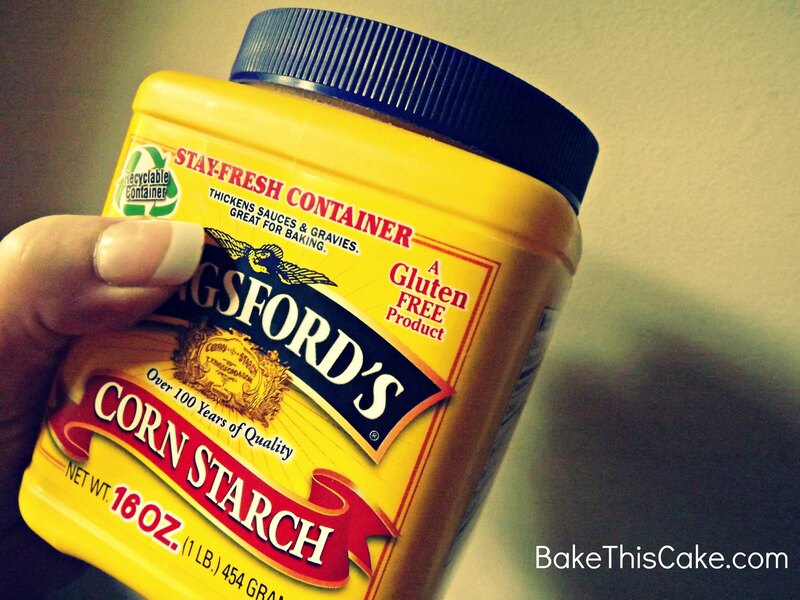 Corn starch in a cake recipe..sounds interesting! This cake looks so good, and how come you are always having such awesome get togethers!! Dang! Looks like fun! !